What should I enter in the URL entry box? Our tool will search for the URL you enter in that box, whether it is the specific URL for a particular page or the homepage domain for the website you´re interested in. Our tool can detect WordPress even in a subdomain different from the URL you entered, as long as it belongs to the same domain. If you are writing a page url instead of pasting it, you don´t have to write “http://” as it´s provided as default. However, if you want our tool to analyse a site with a security certificate, you should make sure that “https://” is present in the url you write or paste (otherwise if both “http://” and “https://” are missing, our tool will automatically add “http://” and you won´t get the results you´re looking for). How much information will I get from the discovered WP theme? Our tool looks for the standard information usually provided, such as the theme name, its author, version, description, etc. But it doesn´t just stop there. It will also look for the screenshot of the theme and for any other kind of additional information that is available and that could be of use to you, such as tags, licenses, distributors, etc. Furthermore, our tool will always check if the theme you´re interested in happens to be a child theme and, if that is the case, it will look for all the available information about its parent theme as well. Besides the information gathered from the website you´re checking, our tool will look for additional information from our databases. 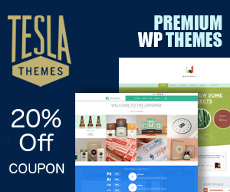 If the theme is a popular one, you will also get statistical information like its current position in our Top Theme list, the percentage of finds or the percentage of analysed sites that are using that theme. If the site I´m interested in does not run on WordPress, will I know it? Yes, if our tool is not able to detect WordPress in that site, it will let you know by means of a message over a red background. This message can tell you that the site is not using WordPress or that it was not possible to detect any WordPress theme. Sometimes our tool will even detect the WordPress installation and its theme in a subdomain of the domain you entered (in which root WordPress was not present). If that is your case and you are interested in it, you can now copy the URL we provide you with in the orange message, paste it on the URL entry box of our tool and let our WordPress Theme Detector do the new search for you! If you want to know more about child themes, you can get a more detailed information in our tutorial series about child themes. Will this tool detect if the discovered theme is a child theme? 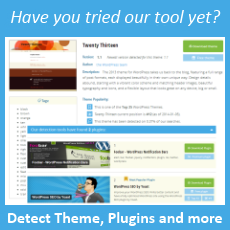 Yes, our WordPress Theme Detector will always check if the theme you´re interested in happens to be a child theme. Will I get any information about the parent theme? 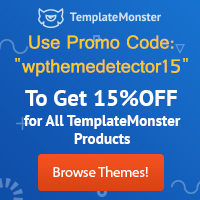 Of course, if the theme you´re interested in happens to be a child theme, WPThemeDetector will look for all the available information about its parent theme as well. . I noticed that this tool also detects plugins. Will it detect all the plugins used by the investigated site? Not necessarily all of them. Our tool will detect all the active plugins used by that website for which references can be found in the html code generated and sent by the site´s server. However, there may be some other active plugins that can´t be found through the information received from the site.